Sebastian Vettel led a second consecutive front-row lockout for Ferrari by taking a scintillating pole position for the Chinese Grand Prix in record time. The German clocked one minute 31.095 seconds as he closes on a third win from as many races in 2018. Saturday at the Shanghai International Circuit followed a similar pattern to last week at Sakhir as Raikkonen led the way through much of qualifying, only for Vettel to pip him at the very last. The Mercedes pair of Valtteri Bottas and Lewis Hamilton were half a second off the pace, with world champion Hamilton once again qualifying slower than his team-mate. Ferrari's triumph snaps a six-year sequence of Mercedes poles in Shanghai - the last four had been converted into victories. Crucially, Ferrari and Mercedes look matched on strategy with all four cars set to start on soft tyres, so the Scuderia are in prime position to press home their advantage. 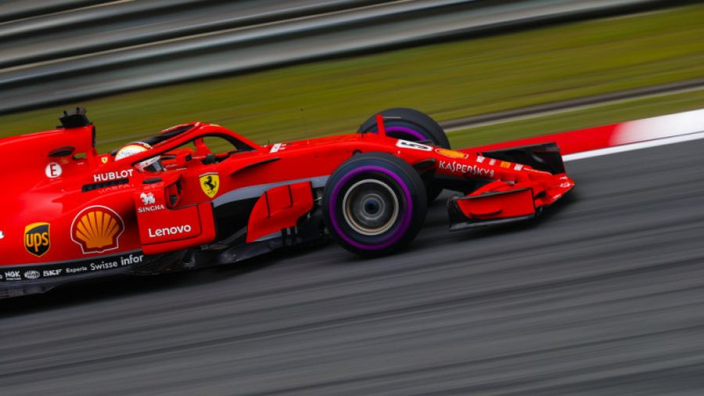 Ferrari have secured consecutive front-row lockouts for the first time since 2006 and the balance of power now looks to be firmly tilting towards the red cars after the hybrid era's Mercedes dominance. Vettel is now looking to secure a third win from as many races in 2018. No driver has ever won the first three grands prix of a season and failed to win the title. Red Bull locked out the third row, Max Verstappen outqualifying Daniel Ricciardo, although the Australian will be fortunate not to be starting from further back after a blown turbo in FP3 prompted a new engine to be fitted, which gave him a solitary lap to get out of the first session of qualifying. In more familiar scenes, Nico Hulkenberg qualified the Renault on seventh for a sixth race in sequence, with Sergio Perez, Carlos Sainz Jr and Romain Grosjean locking out a top 10 that once again features neither McLaren, although Fernando Alonso and Stoffel Vandoorne have secured points in both races so far. Despite trying to pull a tow down the 1.2-kilometre back straight, McLaren pair Fernando Alonso and Stoffel Vandoorne both failed to get into Q3 for a third-straight race. Esteban Ocon and Kevin Magnussen were eliminated, but saw their team-mates make the top-10 shootout. Ricciardo sneaked through Q1 with a solitary flying lap after his car was put back together. Charles Leclerc's Sauber was almost wrecked after spinning onto the pit straight, but he avoided the barriers. The star of Bahrain, Pierre Gasly, fell at the first here, with the Williams pair and Sakhir points-scorer Marcus Ericsson also out.